the instructions listed below. Thank you. Your online contribution will be sent to Lake Region Bible Church as a donation for The Bridge. Credit card transactions will be marked "PAYPAL *THE BRIDGE" on your statements. More donation information is listed below. ● 100% of Donations are used to support the Mission related expenses of The Bridge. We are currently working with about 25 students a week (during the school year). Our sponsoring church pays for the mortgage & utilities of our WiFi Cafe' (Bridge donations are not used for these expenses). Your contributions cover the others costs of our WiFi Cafe' (computer lab, refreshments, etc. ); Recreational sports (equipment, lawn care & sports camps); our Program Director's part-time salary; Leadership & volunteer development & expenses; Scholarships for camps, & other life-enriching programs, offered by us or other groups (connecting students with, & promoting, other groups is part of our mission); and assistance regarding educational & vocational development or benevolent support. On May 1st, we hired one of our volunteer coordinators, Neomi Nicoline, to be our part-time Program Director. Her salary will be paid for out of Bridge donations. Anyone wanting to contribute towards our Program Director's salary should simply give a donation to The Bridge (follow the instructions on this webpage). Thank you. Our Executive Director's salary along with the mortgage & utilities for our WiFi Cafe' are all paid for by our sponsoring church (they are not paid for with Bridge donations). If you would like to make a donation to help cover these operating costs or improve & expand the facilities of The Bridge, please contact our Executive Director Pastor Marcus Johnson (see our "Contact Us" webpage above). Also, for your reference, information about all of our Bridge leaders is listed on our "Leaders" webpage (under the "Leadership" tab above). Thank you for your consideration. ● Donations: You can give a donation online (see above) or by check. Make checks out to: Lake Region Bible Church with The Bridge written in the memo section. Mail checks to: The Bridge, 205 W. Washington Street, Round Lake, IL 60073. ● All donations are tax-deductible to the full extent of the law. The Bridge is a community-based mission sponsored by Lake Region Bible Church, which is a 501 © 3 not-for-profit religious organization (through our group exemption with the Evangelical Free Church of America). 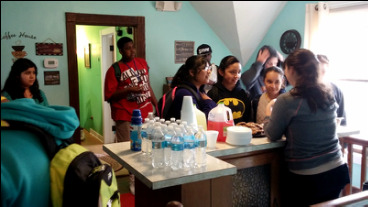 The Bridge works with and offers activities for all youth & young adults, regardless of spiritual interest or religious affiliation (students choose what activities they would like to participate in, etc.). Thank you for your consideration on behalf of our mission.